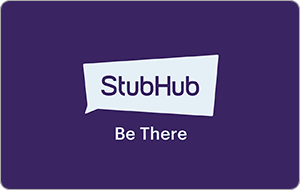 At StubHub, our mission is simple: help fans find seats they’ll love, whenever they want. W e've been doing it since 2000, and continue to lead the way today. W ith a StubHub gift card fans can purchase tickets to the games, shows and concerts they want to see. This is one gift they won’t want to return. 1. Gift certificates and electronic “eGift Cards” or physical gift cards (collectively, "Gift Cards") can only be redeemed on stubhub.com or by calling customer service. We may enable redemption via mobile applications or m.stubhub.com at a later time; check your Gift Card for details. You must have a StubHub account to redeem Gift Cards. To create an account, visit StubHub. 2. Gift Cards are not redeemable for cash and cannot be returned for a cash refund. Gift Cards are not credit, debit or charge cards. No implied warranties attach to Gift Cards. 3. Upon redemption, the entire balance of a Gift Card is deposited to the recipient's StubHub account. Gift Cards are not reloadable and cannot be associated with multiple StubHub accounts. Gift Cards cannot be redeemed for past purchases. 4. If the cost of an order exceeds the Gift Card amount, the recipient must pay for the balance with a credit or debit card or PayPal account. 5. Treat Gift Cards like cash. Lost, stolen, or damaged Gift Cards will not be replaced except where required by law and only with proof of purchase as required and if the Gift Cards have never been used. 7. StubHub reserves the right to close customer accounts and request alternative forms of payment if a fraudulently obtained Gift Card is redeemed and/or used to make purchases on stubhub.com. Invalid or unidentifiable Gift Card numbers will not be redeemed. 8. Purchases using Gift Cards do not count towards StubHub rewards or loyalty programs. 9. StubHub reserves the right to change these terms and condition from time to time in its sole discretion.